The weather is crazy everywhere right now. 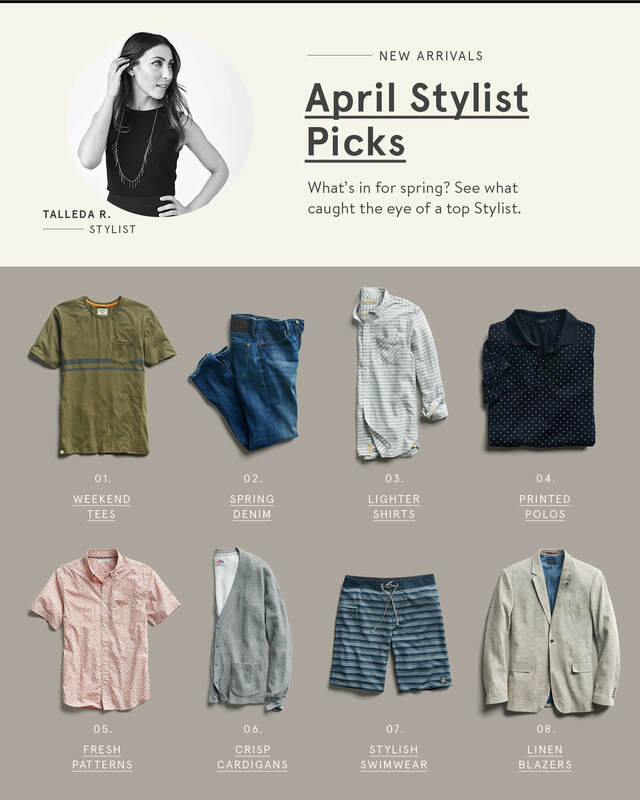 But around these parts, spring showers bring new monthly style picks! In our April edition, Stylist Talleda R. lists the top 10 trends she’s excited to send out to her #StitchFixMen clients. If you like anything featured, request a similar item in your next Fix. Now, without further ado—Talleda, show them what’s up. Stripes are the way to go—they are straightforward and easy-to-wear. You can never have too many tees and spring is the perfect opportunity to try out new styles that are fresh and fun. These are a nice change from the darker indigo and black washes that are typically worn during the winter months. Try slim and straight fits to keep the outfit modern. Pair with printed shirts or basic tees in washed-out neon colors for a cool look. Ditch dark and heavy shirts for lightweight pieces. They’re perfect to wear under your sweaters and keeps your outfit looking fresh and updated. Polos are so versatile, effortless and work for everyone! Wear classic polos to balance sophisticated and casual. Try prints and slimmer fits for a hip take on this style. Florals can be suave, yet totally fun! Swapping out your everyday plaids and basics for a little print will elevate your look and give you that extra style boost. With the various scales, floral prints can work for anyone and any occasion. Master the art of layering by giving a cardigan a try. Opt for a lighter-weight, modern fit cut close to the body and arms with a little extra room for layering. Talleda loves how effortless a cardigan can be while making a huge impact on your style. If you prefer classic, traditional styles, try a cardigan over an Oxford or gingham shirt layered under a textured blazer. For a more contemporary look, wear a cardigan over a striped tee or a henley in a light spring color. Planning a warm-weather vacation? These hybrid shorts will help you go from beach to bar, and save you room in your suitcase. This item is perfect for any outdoor or destination wedding you need to attend this year. The linen and cotton blend keeps you cool and stylish. Transition out some of your winter colors (like olive or navy) in favor of tonal white or stone hues.